Sia will be touring her all-new live show across two continents this spring in support of her forthcoming album. 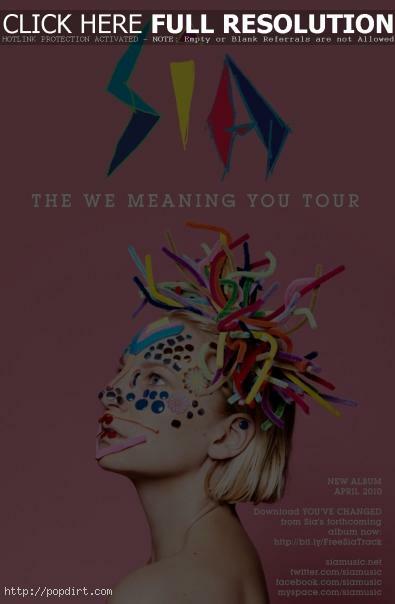 The Australian singer will take The We Meaning You Tour to the US, Canada, Denmark, France, Belgium, Netherlands, Germany and the UK in April and May 2010. It will feature songs from her new album and Sia classics. Tickets go on sale on February 5th, however, you can access the pre-sale, which kicks off on Wednesday (February 3). To get access to this exclusive pre-sale, you will need a special password which Sia will be posting at her Twitter (@siamusic) between now and Wednesday. As part of the pre-sale, there will also be a limited number of VIP tickets for Sia’s shows in Copenhagen, Berlin and London. To find out more about the VIP tickets, stop by SiaMusic.net next week.